HDMI Over IP vs Circuit Switched Video Distribution- tutorial - Video Over IP and HDMI Video Connectivity Solutions. The aim of this article is to compare and contrast traditional video distribution of Display Port and HDMI video using circuit switched solutions vs Video over IP solutions. 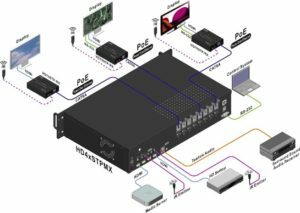 Traditional Display Port and HDMI video distribution is based on video multiplex (mux) / de-multiplexing (de-mux) circuits coupled with video splitting. An example of a 4 input to 8 output HDMI matrix switch is shown in Figure 1. The order of the video mux / demux and split circuitry defines the number of video source inputs and outputs that the video matrix can support. Because traditional video distribution systems are circuit switched, the number of video sources and video outputs are pre-determined. For example, a 4 video input to 8 output HDMI switch will not be able to support additional inputs or displays beyond 4 sources and 8 displays. In essence the switch is ‘hardwired’ can not expand/scale up for future system growth (Figure 2). Figure 3 shows a HDMI video over IP system. The system consists of: 1) HDMI over IP transmitter, 2) HDMI Over IP receiver and 3) Gigabit Ethernet Networks switch. HDMI Video over IP is inherently a ‘connectionless’ packet based transport with UDP, User Data Protocol, to number and provide order to the packets. The TCP protocol is used for applications such as email / web pages to guarantee delivery. In general for HDMI video Over IP, UDP protocol is used instead of TCP because UDP eliminates error checking , re-send on error with the end result being lower overhead and faster packet delivery. The HDM over IP transmitter receives the incoming HD video, encodes, packetizes the video and passes the data to the a managed network switch where the video is routed via multi-cast channels using IGMP, Internet Group Management Protocol. Multi-Cast and IGMP allows for more efficient use of network resources. On the display end, the HDMI over IP receiver subscribes to the a multi-cast video group and decodes the desired video stream. An alternative method of distributing HDMI video over IP is to segment the network switch into VLANS ( virtual local area networks) and choosing the desired video source by selecting the appropriately assigned VLAN. This method has the advantage of tightly managing network traffic as each VLAN is isolated from other video channels to limit collision. Traditional circuit-switched video distribution solutions are defined by the order of the MUX/DEMUX circuitry. For example a 4 x 4 video matrix switch requires: 1×4 video splitter ( x4) + 4 x1 switch( x4). The downside of this approach is the video distribution system is limited by the initial circuit size and does not allow for additional sources or displays to be connected( Figure 2). 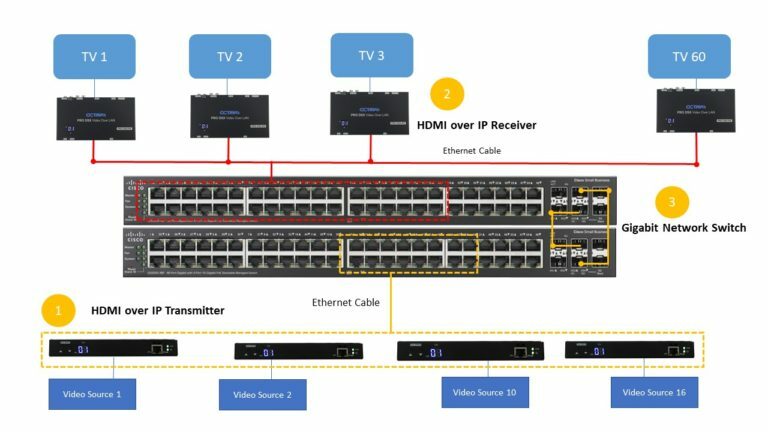 The main advantage of a HDMI video over IP system is its scalability- ability to expand the number of sources and displays in the video distribution network. Using HDMI video over IP solutions, system administrators can create virtually any practical sized video distribution system simply by installing HDMI over IP transmitters or receivers as required. An example of a 16 video source to 60 display system is shown below. Traditional circuit switched based HD video distribution systems deliver native video resolution from source to screen. Video over IP systems in contrast, require that the incoming video be processed and compressed before packetizing and transporting over the network in order to preserve channel bandwidth. Traditionalist often cite that Video over IP uses compression therefore reduces video quality. However, with major advances in video processing and compression technologies, compression algorithms are often ‘visually lossless’ and provide ‘ just right’ picture quality that exceed viewer expectations. For example, digital video systems used by major Cable, Satellite TV operators, and streaming video services ( Netflix, Amazon, YouTube for example) all utilize video compression while providing stunning video quality to the viewer over the limited bandwidth pipeline to the home. Just like these video service providers, HDMI video over IP distribution systems utilize ‘visually lossless’ compression to deliver stunning video and operational flexibility to the video distribution system. In general there are 2 categories of video compression techniques used in HDMI video over IP systems, inter-frame and intra-frame compression. H.264 utilizes inter-frame compression algorithm which interprets groups of video frames in terms of the differences/changes between the neighboring frames and a ‘keyframe’ . Only the differences/changes is transported instead of the entire video frame. For example, video frames and their adjacent neighboring frames often contain the same background with only the main subject varying from frame to frame. In inter-frame compression this concept is exploited . That is, ‘static’ background video info is not transported while the changing dynamic video subject is transported and ‘redrawn.’ As an example, in Fig 4 , the background in frames 1-4 are essentially the same while only the subject ( balloon) changes from frame 1 to 4. Motion JPEG 2000 : MJPEG2000, Motion Joint Picture Experts Group 2000, is an intra-frame visually lossless algorithm. In contrast to H.264, all info within ( intra) a frame is coded independently using JPEG 2000 compression and not depend on neighboring frames. Vast majority of digital still images utilize JPEG ( .jpg) image compression. JPEG 2000 is an improved version of the original JPEG format providing superior image quality and file size efficiency. Mature and used by major Cable and Satellite operators. Robust / resilient, does not rely on neighboring video frames to calculate. The Octava HDMI Video Over IP system utilizes MJPEG2000 compression to provide superior video quality , low processing latency while achieving bandwidth requirements. Video latency or delay is the time delta measured between the start of video frame at the source and the time that the video frame appears on the display. Traditional circuit switched based HD video distribution systems does not introduce video latency as there is no video processing involved. Video Over IP technology requires that incoming video be encoded at the transmitter and decoded at the receiver unit. The encoding and decoding time manifests itself as latency. For vast majority of applications, the latency does not at all affect the viewing experience. To put into perspective, satellite based TV providers locate their satellites in geo-synchronous orbit ( ~22,000 miles above earth). 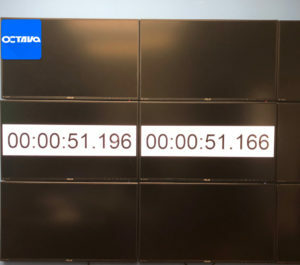 The propagation time of the uplink and downlink , NOT including any processing ( video compression , Forward Error Correction, video decompression), is 240mS. The viewer does not experience any of the delay because there is no ‘0’ second reference point. The PRO DSX Video Over IP processing latency varies from few mS with typical being ~ 16mS to 32 mS. Figure 5 shows the time delta of a direct feed vs the HDMI video over IP solution. Note that the direct video feed ( left screen) is 30 mS ahead of the video over IP ( right screen). Traditional AV video distribution solutions in general utilize HDMI or Display Port cables for connections ranging from 6-25 ft. When Running longer HDMI cable lengths, additional video extenders/boosters, HDMI over CAT cables or HDMI video over fiber optics are needed. Because traditional AV matrix outputs the original video resolution, cabling selection and installation procedure is crucial. For example in longer cable links: 1)CAT6 UTP or better cable should be used 2) No RJ-45 network cable coupler or patch panel in the link path 3) cable loops /coils should be avoided. For reference, check out the best practices for installing cables. HDMI Video over IP solutions are network protocol based that is robust and tolerant to the installation environment. For example, in many installations, legacy network cables can be re-used and can be connected through cable couplers and patch panels. Finally, when a PoE enabled HDMI over IP solution is installed, external power supplies can be eliminated , thus allowing for simple tidy installations. Traditional circuit switched AV video distribution solutions typically include a main unit that houses the entire switching fabric and supporting functions. Any failure in 1 component can result in an inoperable system. HDMI Video over IP solutions are inherently modular by design ( Fig 5). Each individual transmitter and receiver are standalone independent units. Any single failure will be limited and isolated. In most cases, failures can be rectified by replacing the faulty transmitter or receiver unit. In addition, gigabit network switches from reputable vendor are used by enterprises such as banking, government, prove to have excellent reliability , MTBF, and are readily available and mature. Finally, HDMI video over IP solutions such as the Octava PRO DSX can be directly powered via Power over Ethernet( PoE) from a network switch meeting the IEEE 802.3af specifications. This eliminates the need for additional power adapters/connection. Furthermore, managed Ethernet switches enable power management of connected devices using PoE allowing users to schedule system on/off to reduce power consumption and prolonging life time of the Video over IP transmitters and receivers. Traditional circuit switched AV video distribution matrix switch is a vital equipment in many Audio Video systems providing excellent video quality, value and is familiar to the end user. In the tech world, the adage ” Anything that can be IP-based will become IP-based,” certainly has applied to the PRO Audio Video Distribution field. 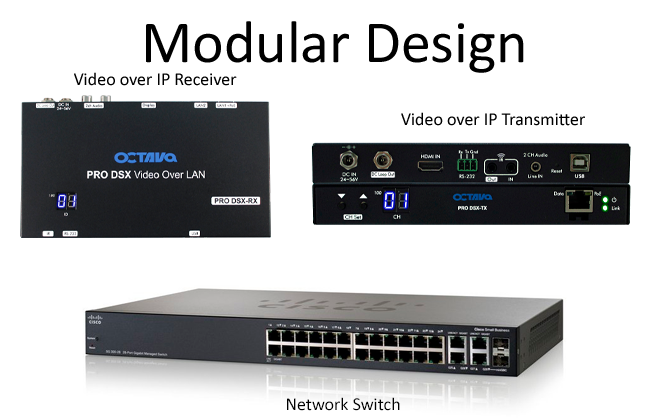 Octava has been innovating and providing HD Video Over IP solution since 2013. Since then, many other solutions providers have also transitioned to IP-based video distributions solutions providing end users multiple options and driving the industry forward. HDMI Video over IP is an excellent alternative for many enterprise professional audio video systems requiring large scale deployment of sources/displays, long cable links, excellent reliability, expandability and ease of deployment. In this paper, we have examined the advantages and disadvantages of traditional circuit switched audio video distribution solutions vs Video over IP solutions. Market and technology dynamics will continue to drive Audio Video distribution towards IP-based solutions. IP-based solutions offers scalability, new systems architectures, new user experiences and services not possible with traditional circuit switched AV distribution systems. Video Quality: Traditional audio video matrix switches provide slightly better picture quality then Video over IP solutions because it does not require compression. Video over IP does provide excellent video quality and will exceed expectations in most applications. Scalability/Expandability: Video over IP is easy to scale and expand as your system requires. Traditional AV video matrix is not expandable. Cabling Infrastructure: Video over IP uses standard network cabling and easy to deploy and tolerant to installation environment. Reliability: Video over IP solutions are modular- failures should be independent and non-correlated to other parts of the system and easier to identify/resolve.